A street is flooded after an earthquake and tsunami struck Ishimaki City. In the wake of the ongoing disasters in Japan – earthquakes, tsunamis, impending nuclear crises, and now a volcanic eruption, to boot – it’s been heartening to witness the outpouring of support and desire to help, coming from (nearly) all corners of the internet. On the other hand, all these “text to donate” tweets and status updates – it just take 15 seconds! it’s so simple! a 5-year-old could do it! – have left me feeling a bit uneasy. Choosing a non-profit organization to donate to shouldn’t be a mindless endeavor. After all, it’s your money; presumably you worked hard to earn it, and only have a limited amount to give. Why not do a little research and ensure that it’s put to good use – and in support of an organization that you can feel good about? Also, while I’ve tried my best to identify which orgs do and do not have dedicated funds for disaster relief in Japan – due in no small part to my general distrust of many of the larger animal welfare groups – Shannon reminds us in the comments that earmarking donations for a specific program or disaster can have the unintended consequence of making an organization’s efforts less efficient, flexible and able to adapt to change. (Holy run-on sentence, Catwoman!) See, e.g., this article from Slate (whose title is a bit obnoxious, but wevs). Most of the groups listed below maintain general funds for disaster relief, without offering the donor the option to earmark money for a specific disaster or country – which is perhaps the most ideal of all possible scenarios. NPOs providing assistance to human and nonhuman animals are listed separately, under bullet points 2 and 3. While I note possible pros and cons for many of the organizations, ultimately it’s up to you to be your own decider person. Charity Navigator accepts no funding from the charities that we evaluate, ensuring that our ratings remain objective. The database is free and easy to use. Registered users can also rate charities to which they’ve donated, volunteered or received services from. A donation is optional, but shiny. Humane Charity Seal – The Council on Humane Giving’s “Humane Charity Seal” program is administered by the Physicians Committee for Responsible Medicine (PCRM). The website allows users to search its database of charities by keyword, location and/or status to find out which NPOs fund animal testing – and which don’t. You can make a donation to the group here. Yahoo! Dollar-to-Yen Conversion Calculator – This may come in handy if you choose to contribute to a group based in Japan! in Ofunato, Iwate Prefecture, on Saturday. What follows is far from a comprehensive list of the many NPOs assisting the human survivors of the earthquakes and tsunamis in Japan. Given that this blog’s focus is on nonhuman animals, this is the area to which I’ve devoted most of my research efforts. However, I do want to bring attention – positive and negative – to a few organizations that are taking the lead in responding to these disasters. Also, I’d like to highlight several lesser-known groups that may have slipped under your radar. The Red Cross – The overwhelming majority of requests for donations flooding the internet in the last week have focused on the Red Cross. According to an appeal distributed by MoveOn.org, the Red Cross operates 92 hospitals in Japan and has deployed 700 medical relief volunteers across the country already. As in international NGO, it is well-poised to provide aid in the immediate aftermath of a natural disaster. The Red Cross has an ongoing history of misusing its funds and misleading donors. See, e.g., September 11 controversy and Hurricane Katrina controversy on Wiki. As per US FDA policy, the Red Cross does not accept blood donations from gay and bisexual men. While it has been lobbying against this policy since about 2006, the group arguable should have stood opposed to this homophobic, discriminatory policy much, much sooner. Finally, the Red Cross has a long history of racial discrimination, and during the AIDS epidemic of the 1980s, it resisted screening its blood for HIV, claiming that it would be cost-prohibitive. Additionally, it has been fined multiple times by the FDA for its failure to adequately monitor its blood supply. For more, please read The truth about the Red Cross: The right-wing, scandal-ridden “charity” that isn’t really a charity at the Socialist Worker. Founded in 1984 by volunteer doctors and nurses, International Medical Corps is a private, voluntary, nonpolitical, nonsectarian organization that works to improve the quality of life through health interventions and related activities that build local capacity in under served communities worldwide. International Medical Corps provides life-saving relief while building self-reliance through programs that focus on education and training. As a result of this approach, approximately 96% of its field-based staff and health professionals are recruited from the local community, helping ensure that the skills stay within the area long after the program has ended. The emphasis on capacity building through education and training is central to all International Medical Corps programs. Its central program priorities include: emergency response; health capacity building; women’s and children’s health and wellbeing; mental health; and clean water, sanitation, and hygiene. In addition to these priorities, International Medical Corps also runs programs providing nutrition services, economic and agricultural livelihoods support, and prevention, testing, and care for communicable diseases like HIV/AIDS, tuberculosis, and malaria. Based on its assessments at evacuation centers and a regional hospital where critical patients have been referred, International Medical Corps will work to fill critical gaps – including addressing the need for food, water and chronic medicines at shelters, providing psychological support, and if needed deploying four medical teams currently on standby. IMC has an emergency response fund to which you can donate directly; it’s unclear whether any of these funds will go to support the longer-term Livelihoods & Agriculture programs. In addition to health care and assistance (preventative and otherwise), MSF operates Therapeutic Feeding Programmes to combat malnutrition; helps to provide clean water and sanitation to the communities its serves; conducts epidemiology surveys to improve the care it provides; surveys rates of violence in politically unstable regions; and bears witness to injustice, oftentimes pressuring governments to act. You can read more about the group’s history, mission and principles here. MSF currently has a team of 10 people, divided into three teams, conducting mobile clinics and assessments in Miyagi prefecture, following the huge earthquake and resulting tsunamis last Friday. The tsunamis have decimated coastal areas, which after huge efforts of Japanese authorities, are now becoming accessible by road. MSF is now identifying specific needs – which include oxygen, non-food items, medical items and water – and will work with Japanese authorities to assist these populations. More MSF personnel staff are standing by in Japan and other countries, to head to Miyagi prefecture to increase our assistance. You can follow the group’s response on the main page of its website, where updated headlines appear daily. Donations are accepted through national offices (a list is available here), but cannot be earmarked toward any one program or disaster. While some of the medicine and food that MSF distributes is no doubt animal-based, the exigent circumstances in which it operates complicates the situation, as does the lack of cruelty-free options when it comes to particular medications (e.g., vaccines). As an ethical vegan, I don’t believe that humans have the right to harm or exploit nonhuman animals unless doing so is absolutely necessary to our survival. I believe that MSF’s work is necessary and vital. Additionally, I appreciate that the group does not entrench animal exploitation in the communities it serves, such as through animal agriculture programs. It is also Humane Seal approved. Many people who are skeptics and humanists are frustrated that so many charitable organizations, especially those that help people afflicted by natural or human disasters, have efforts coordinated by religious organizations. These organizations sometimes proselytize to the people in need of their services. This is entirely unacceptable to skeptics and secular humanists. The money collected through SHARE goes directly to secular relief efforts in the nations or areas afflicted. By donating to SHARE, you can pool your resources with other like-minded individuals who wish to effect change in the world. The monies raised for SHARE’s Japan Earthquake/Tsunami Relief Fund will go to Doctors Without Borders. Donate here. You can make a donation to ShelterBox here, and track where your box is sent through the group’s website. In some situations, the boxes are distributed by ShelterBox Response Teams; those interested in volunteering can find additional information at http://www.shelterboxacademy.org. The Search Dog Foundation (SDF) – Based in California, SDF recruits potential search and rescue dogs, trains them at a cost of roughly $10,000 per dog, and partners graduates with firefighters and other first responders to find people buried alive in the wreckage of disasters. Dogs are not bred, but rescued and/or “donated,” and SDF promises that all dogs entered into the program (whether or not they graduate) have found a home for life. SDF currently has multiple teams on the ground and working in Japan. Disaster search requires very specific talents and skills in both dog and handler. A disaster site is a treacherous environment: noisy, chaotic, dust-filled, and sometimes dark. Disaster search dogs must have the ability to perform at a high level in the worst setting imaginable. At Ground Zero, for example, the ‘pile’ was a mountain of debris seven or eight stories high composed of twisted steel and wobbly, uneven surfaces, hot spots and gaps in the rubble where fires were still burning. It takes an extraordinary dog-one with extreme boldness, energy, strength, agility and drive-to approach every training exercise, and every deployment, with energy and determination. These are dogs that LOVE to work, NEED to work, and want nothing more than to be out on the rubble, searching! In the wake of disaster, search and rescue dogs inhale the same toxic fumes as do their human handlers; are deployed to unstable areas ravaged by earthquakes, tsunamis, hurricanes, floods and the like (oftentimes, with the threat of dangerous weather ongoing); and ultimately put their lives on the line so that they may save others. A heroic task, indeed – and, while it’s a choice made freely by the humans involved, you simply cannot say the same of nonhuman animals. A love for the physical and mental stimulation of search and rescue work does not equal knowledge and consent of the risks it entails. Volunteer opportunities at FFLG include food distribution; building infrastructure; providing medical assistance and education; and other pro bono professional services, both in the U.S. and internationally. In addition to monetary donations, FFLG accepts vehicles for resale and airline miles. FFLG maintains an emergency relief fund, but it does not seem as though a donation can be earmarked for a specific disaster. through a street filled with debris. This section in particular will be updated as new information becomes available, so check back often. Funds will be used directly for animal rescue and support. We can not yet know what international groups will be specifically donating but we expect our funds to be paying for veterinary care including vaccines, microchips, antibiotics, and medicine, food, cages, and cost of transporting animals. Donations can be made through Paypal, ChipIn, money order or direct transfer; details will be posted and updated on the group’s FB page. JEARS is also in need of a volunteer professional web design/hosting firm to help develop and maintain a website, in order to facilitate their rescue efforts. JEARS has been pretty awesome at keeping its supporters updated on Facebook, so be sure to “like” its page and share it with your friends. Those in Japan can also report and request help with injured or homeless animals – or otherwise communicate with the JEARS volunteers – via its Facebook page. Thankfully, our area of the country received no damage and now we have to get to work right away to help the animals in need. We are preparing to receive animal here at HEART and we are working closely with Japan Cat Network and Animal Friends Niigata to save as many animals as possible. Niigata is the closest to the affected areas and will be our base of operations. We will be going out tomorrow to distribute food and water and to try and make an initial assessment. Please check our regular reports on Facebook to find out what is needed and how you can help. Please see the main page of the group’s website (in English) for ways to donate. Animal Garden Niigata / Animal Friends Niigata – Established in 2008 by Niigata resident Isabella Gallaon-Aoki, Animal Garden Niigata cares for and rehomes some of the stray animals living in Niigata Prefecture, as well as other areas of Japan. It also conducts animal welfare outreach and education in the surrounding communities. As reported by HEART-Tokushima, the disaster relief response will be based in Niigata. For ways to donate, go to its how you can help page. We are all greatly saddened and have been continually horrified by news of the devastation, following the recent earthquake here in Japan. We, the kitties at the JCN Kansai shelter, and the shelter itself, are all fine. We’d like to thank everyone who has written to check on us, for their concern! We felt the initial earthquake at the shelter, as well as some aftershocks, but are far enough away from the hard hit areas to be safe. Many of our volunteers in the Kansai and Kanto regions have reported in as all being safe, as well. However, we remain very concerned about the animals in the severely effected areas, who may be overlooked in the midst of so much immediate need to address human concerns. We are currently working with two other no-kill organizations to coordinate plans for getting animals from these areas out to safety, and have already begun helping people with pets in crisis. We are in need of volunteers willing to provide foster care, those able to transport animals, help expanding our potential shelter capacity, and funds or materials for use with rescue/rehabilitation efforts. Click here to see how you can help JCN. At present we can only witness the devastation caused by yesterday’s earthquake and tsunami on our television screens and make contact with friends in Tokyo and other affected areas. Although a country like Japan experiences earthquakes frequently, nothing had prepared us for one on this scale. From our experience of the Great Hanshin earthquake on January 17th 1995, we know that the number of homeless pets may be immense. The priority after any earthquake is the saving of human life, moving people into emergency centres and then repairing the infrastructure. In the case of Kobe most of the animals that came to us came from the emergency centres where people has sought refuge with their pets. Others were ones that had been rescued from destroyed houses or off the street by local people. In that one year we took in 600 animals, mainly dogs and cats but also rabbits and birds. Here at ARK we are preparing for what might be a huge influx of animals. We already have some facilities in place and a team of experienced staff able to deal with traumatised animals. We may have to build emergency shelters as well. The logistics of getting animal from the Tohoku/Sendai area is immense since roads and other transport links have been cut and may take time to restore. Our only means to get animals down to Osaka may be by helicopter, which was one method we used after the Kobe earthquake. Please visit the group’s website for updates. Donation information is available here. Nippon Society for the Prevention of Cruelty of Animals (SPCA) – The Kon Motoe Animal Shelter in Ibaraki – operated by the Nippon SPCA – suffered earthquake damage. According to Kinship Circle’s notes, “On 3/13/11, the Japan SPCA brought rescue supplies to its earthquake-damaged network shelter in Ibaraki and evacuated the most vulnerable dogs.” Additional information is available on the Nippon SPCA’s website (in English via Google Translator). Because it’s receiving aid from other Japanese groups whose operations were not disrupted by the quake, it may be best to donate through the Japan SPCA or JAWS (see below). Donation information for the Japan SPCA and JAWS can be found (in English, via Google Translator) here and here, respectively. Currently, it looks as though they are only able to accept wire transfers. World Vets – Operating in 25 countries, World Vets provides “veterinary aid around the globe in collaboration with animal advocacy groups, foreign governments, US and foreign military groups and veterinary professionals abroad.” Its “Gift Catalog” offers a good overview of the services it provides. World Vets has a whole series of relief teams lined up and on standby pending the outcome of our first responder deployment. As long as radiation and nuclear threats remain we must consider the safety of volunteers and not contribute to potential victims of this unfortunate situation. At this time World Vets is not recruiting volunteers for its disaster response efforts in Japan. Should this change for follow up assistance in the long term we will select volunteers from our members database. If you are not a member and would like to join, please join HERE. Last Chance for Animals (LCA) sent a Special Investigations Team (SIT) to Japan to assist with animal rescue. The SIT is working with Japan Earthquake Animal Rescue and Support (JEARS), a coalition of no-kill shelter groups and volunteers, working to save, support and reunite lost and abandoned animals in the wake of the disaster, and professional animal rescue team, The Kinship Circle. You can follow LCA’s progress on a special blog dedicated to animal rescue in Japan (LCAJapanRescue), and make a donation here. Kinship Circle – On its website, Kinship Circle reports that it would like to deploy a team of responders to Japan, in order to assist JEARS and the Nippon SPCA in its rescue efforts. Currently, it’s trying to raise at least $25,000 for this purpose. (See the newsletter dated 3/19/11, below.) It hopes to provide financial support to JEARS and the Nippon SPCA as well. You can make a donation to Kinship Circle’s Animal Disaster Aid Fund here, or sign up as a disaster aid volunteer here. Additionally, it has compiled a comprehensive list of animal rescue resources here. We are working with member societies such as the Japanese Animal Welfare Society (JAWS) and looking at ways to help them enter the restricted areas and help the animals people have taken with them into the evacuation shelters (when this has been permitted). The situation is still very serious; not only with the well reported story of the ongoing nuclear threat, but of the as yet under-reported story of what has happened to all the displaced people and their animals. You can follow the WSPA’s progress on its Animals In Disasters blog. U.S. residents can make a donation to the WSPA’s Disaster Relief Fund here; those living outside the U.S. can choose from the list of WSPA offices here. American Humane Association (AHA) – As of March 16, the AHA reports that its Red Star Animal Emergency Services team is on stand-by and ready to deploy to Japan, but is waiting to be allowed in by the government. (Though its claim that “the Japanese government has not yet allowed even Japanese organizations to begin large-scale animal rescue operations” seems odd, given that other groups – international and local – are currently conducting animal rescue operations, if even on a limited scale. Go big or go home?) Updates will be posted on the AHA blog. Regarding the donations that are being received by American Humane Association, I can assure you that 100 percent of the donations received for Japan animal relief will go to helping the animal victims in Japan. That means American Humane Association will not even take a portion of donations to cover our actual administrative costs. Every single dollar raised goes to the animals in Japan. In the event that we are not able to deploy our Red Star Animal Emergency Services team to Japan to assist the animals directly, we will grant the funds we receive to the appropriate agencies that are providing animal emergency relief services in Japan. You can make a donation on the AHA’s website; just be sure to select “Japan Relief Fund” from the drop-down menu. 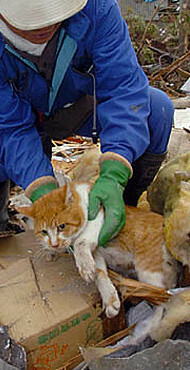 In the aftermath of the March 11 earthquake and tsunami double-strike that battered Japan’s northern coast and set off a mounting toll of death and destruction, Humane Society International and The Humane Society of the United States have deployed disaster response staff to the region, and reached out to Japanese partner organizations involved with animal care and rescue to identify where and how best to provide emergency support and veterinary attention. HSI Lead Disaster Responder Kelly Coladarci is in the Philippines and has contacted Japanese organizations to help them evaluate all animal-related needs. Moreover, both HSI and The HSUS will provide aid to various Japanese organizations, supporting their efforts to assess the scope of the disaster’s effects on animals, to purchase and transport essential supplies, and to establish appropriate shelters and other needed bases of operation in or near the strike zone. Helping Japan at #SXSW: A fundraising table at the Austin music and film festival South by Southwest, dedicated to disaster relief in Japan. Buttons and signage surround a box loosely filled with one, five, and twenty-dollar bills. One of the signs directs its audience to the website http://helpsavejapanatsxsw.net. CC image via Flickr user Zadi Diaz. Events are arranged so that the most time-sensitive ones appear first. Once they expire, they’ll be bumped to the end of the list. If you’re holding vegan fundraiser to help with disaster relief in Japan, please let us know all about it in the comments! The Chicago Diner’s Disaster Relief Benefit – From March 18 through April 15, The Chicago Diner will donate $1 for each Titanic Burger, Lucky Leprechaun Shake, and copy of The Chicago Diner Cookbook it sells to Direct Relief International & AmeriCares. Vegan Bake Sales! – Activism at its yummiest. While a comprehensive listing of all the scheduled vegan bake sales to benefit Japan is well beyond my abilities, I would like to point you to two resources in particular. a) The PPK forum has an open thread where users can promote their individual bake sales for Japan. Isa started the thread with the intention of creating a centralized blog post in which to list them all. Though the post hasn’t materialized yet, you can keep an eye out on the PPK blog. On April 23 through May 1 (two weekends and the weekdays in between), groups from across the world will hold vegan bake sales. Each participating group gets to choose its venue, what to sell, and how it uses the proceeds. We invite you to participate! You can hold the bake sale on any day during the period—or on more than one day if you like. Just about anyone can join in. The main rule is that all items sold must be vegan, and no materials (e.g., books, pamphlets, etc.) encouraging animal exploitation may be distributed during the sale. Participating bakers can sign up here, and potential customers can scope out a list of sales here. Food Fight Fundraiser Weekend for Japan – On March 19 and 20, Food Fight Grocery in Portland will donate 10% of its in-store sales to Japan Earthquake Animal Rescue and Support. Now’s the time to stock up on Daiya and candy bars, people! on a beach in Puri, India, on Saturday. This section includes links to action alerts, most of which focus on nuclear energy due to the unfolding nuclear crises in Japan. 03/27/11 – Care2: Obama: No More Subsidies for Nuclear Energy! 03/19/11 – Nuclear Information and Resource Service (NIRS): It’s time: demand permanent shutdown of GE Mark I reactors! Officials in protective gear check for signs of radiation on children who are from the evacuation area near the Fukushima Daini nuclear plant in Koriyama on Mar. 13, 2011. Here you can find links to websites, blogs and select news stories, with a focus on environmental coverage and vegan viewpoints. This list is far from comprehensive, due to the ongoing and large-scale nature of the situation. 03/18/11 – vegansaurus! : Forget iodine pills, just quit dairy! Search and rescue dog Pia waits with members of the German Federal Agency for Technical Relief to board a plane to Japan near near Lautzenhausen, Germany, on Saturday. Newsletters appear in reverse chronological order. 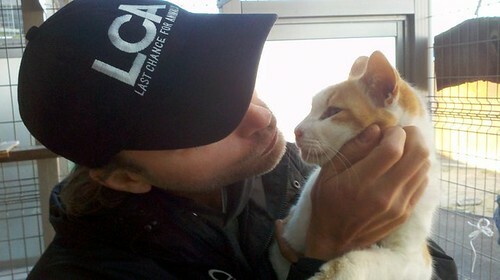 Subject: Support LCA’s Efforts to Help Animals in Japan! Support LCA’s Efforts to Help Animals in Japan! Since the terrible earthquake and tsunami in Japan on March 11th, thousands of people have been forced to evacuate their homes and move to a safer area. Many people have not been able to take their companion animals with them, and these pets are left behind to fend for themselves, with limited supplies of food and water. The team first went to Hikone in central Japan to work with David Wybenga of Japan Cat Network, a non-profit organization dedicated to Japan’s stray and abandoned cat population. David has been working for over ten years to not only help the cats of Japan find safe and loving homes long before this disaster began, but also to inform and educate people that stray cats are not in fact vermin as they are often viewed. David and the team were able to rescue several stray and abandoned cats over the days they worked together. The team then moved north to the JEARS base camp outside of Niigati for the next phase of the operation. Here they set up feeding stations and live traps to lure the frightened animals out of hiding so they could be transported to safer places and shelters that had been prepared especially for them. 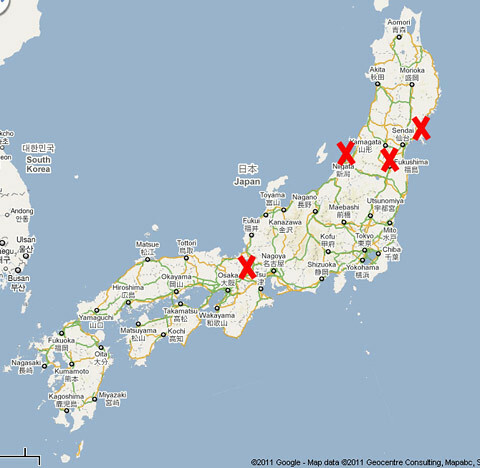 The team will next be heading south of Fukushima nuclear plant to investigate reports of abandoned dogs, cats and cows. They will be spending the night in Iwate – near the area where ‘The Cove’ was filmed – and will also be investigating a feral cat refuge off the coast of Sendai. Follow the daily blog here of one of LCA’s Special Investigators in Japan. Please donate to LCA so we can continue to keep our Special Investigative Team in the field doing what we do best; Helping Animals! In Sendai — a city in Miyagi Prefecture that shared the brunt of a 9.0 earthquake and resultant tsunami — a man ran to warn neighbors. He returned home to find his beloved Akita, Shane, missing from his backyard. With the tsunami in rapid pursuit, he fled to higher ground. 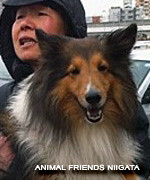 Six hours passed when a dog was spotted outside the school evacuation site. Shane had plunged into chest-deep waters to find his guardian. The dog had never seen this school, but somehow clung to debris and floated there. Cut and shivering, Shane was alive! Fortunately, Isabella — who leads rescue groups united as Japan Earthquake Animal Rescue and Support (JEARS) — was at the school with a vet to show the grateful man how to clean and treat Shane’s wounds. Kinship Circle joins Animal Friends Niigata, Japan Cat Network, HEART-Tokushima, and Nippon SPCA to aid survivors like Shane. Our responders, credentialed in search and rescue, assessment, veterinary first aid, and crisis sheltering will provide ground support. We’ll also help via donations as long as we can. 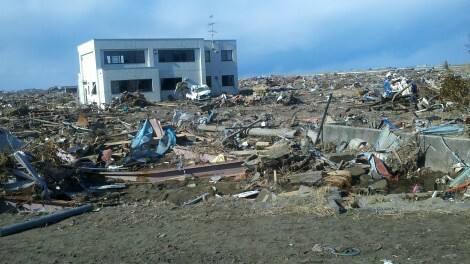 We need a minimum $25,000, to get our teams across a vast disaster-torn area in Japan. We hope to raise more, to support Japan animal groups working against impossible odds to access Sendai and decimated cities in Fukushima and Miyagi Prefectures. With the nuclear plant situated in Fukushima, we even had to buy a Geiger Counter for volunteers to measure radiation exposure. ♥ Send rescue and veterinary trained teams. ♥ Fund gas and transport to reach animals. ♥ Get emergency vet medical supplies. ♥ Support key Japan animal organizations. For animals, the disaster is trifold: A 9.0 earthquake, a tsunami with waves as high as 33 feet, and mass evacuations due to radiation from the quake-shattered Fukushima Dai-ichi nuclear power plant. Kinship Circle animal disaster aid teams just returned from helping animal victims of Brazil’s catastrophic mudslides and floods. In Japan, we face gasoline rations, vehicle shortages, power outages and more. But after talks with our contacts at Japanese animal rescue organizations, we decided to offer hands-on and remote support. Where are all the dogs, cats, horses…and others? While many animals died in the initial quake and tsunami waves (some as high as 33 feet) a Japan colleague estimates that for every half-million people displaced in shelters, 1 of each 5 people have a dog. Where are these dogs now? And cats? There are so many cats in Japan that the number impacted could climb into the hundreds of thousands. The repercussions for horses, farmed, and other domestic animals is unknown at this time. We also cannot yet measure damage to wild or confined wild (zoos, aquariums) animals. 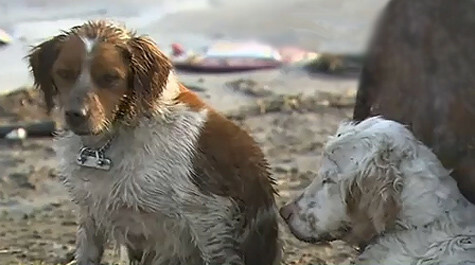 A loyal dog won’t leave his wounded buddy behind in the rubble of Japan’s quake and tsunami. A video of the two survivors went viral on the Internet as people clung to this image of love and perseverance. The dogs are reportedly safe now. WHY SAVE ANIMALS IN JAPAN? Kinship Circle specializes in animal disaster aid. We’re not a community shelter/rescue group. Our members and disaster-trained responders live around the world. We activate for USA disasters too — Gulf Oil Crisis, Hurricanes Gustave & Ike, Iowa Floods, Hurricane Katrina & Rita… Decisions are based on NEED — not GEOGRAPHY. Japan’s historic quake and tsunami harmed a large number of animals. THANK YOU SUPPORTERS! Back-to-back disaster deployments — Brazil floods-mudslide and Japan quake-tsunami — have pushed us behind in paperwork, but your gift is working hard to sponsor rescue and veterinary trained responders on the ground. Thanks for your patience. You’ll receive a receipt. 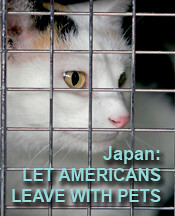 URGENT: Let Americans Evacuate Japan With Their Animals! With the final outcome for Japan’s quake-shattered Fukushima Dai-ichi nuclear power plant uncertain, foreign citizens are evacuating Japan. Americans may find that their pets cannot go with them. While difficult to imagine in a post-Katrina world, Department of State policy does not evacuate companion animals. U.S. Citizens: Appeal to the U.S. State Department to let Americans leave with their animals. Stress that pets be allowed to accompany families from Japan — and in all future disasters. – People may refuse to evacuate if forced to leave animals behind. – Abandoned pets are often released into streets or left to die by starvation. – Let people evacuating Japan bring companion animals (without weight restriction) with them. – Permanently permit and allocate resources for animals to join caregivers leaving disaster zones. To volunteer in disasters, click here. URGENT: Bill To Undo Puppy Mill Anti-Cruelty Law May Pass! 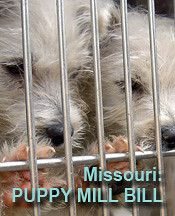 Missouri is America’s Puppy Mill Capitol. Last Nov. nearly 1 million voters passed Prop B, the Puppy Mill Cruelty Prevention Act. Shockingly, the Missouri Senate has since okayed a bill to gut Prop B. Similar legislation may now pass in the House — as lawmakers ignore voters’ will and cling to status-quo cruelty. Missourians Only: Ask your state Rep to reject a bill that dilutes or repeals Prop B.
Missourians & Others: Ask Gov. Nixon to veto any bill designed to undo Prop B. Tell him that Missouri will lose your tourism and business dollars if Prop B is diluted. Once again, the U.S. Department of State is refusing to allow U.S. nationals evacuating a disaster zone, this time in Japan, to take their animal companions to safety. The official policy of the Department of State is that it does not evacuate pets. Please contact Secretary of State Hillary Rodham Clinton and ask that the State Department allow Americans, without exception, to evacuate all their family members from Japan and from every future disaster area. PETA agrees with the Centers for Disease Control and Prevention public health veterinarians and others that “… a lack of plans and resources to evacuate ‘incidental’ pets with their owners has been known for decades to be a primary reason why citizens will refuse to evacuate in the face of imminent life-threatening danger.” Unfortunately, when it comes to disasters, people who love their animals often pay with their own lives. In response to PETA’s February requests to Secretary Clinton to allow animals on U.S. government–chartered evacuation flights during the coup in Egypt, some animals were finally allowed on the last flight out of that country. While a promising, and temporary, start, PETA asks that all companion animals, regardless of size, be allowed safe transport out of Japan and any future disaster zone. 1. People evacuating Japan be allowed to take their companion animals, regardless of size, with them. 2. The State Department permanently change its official policy to allow pets to be evacuated, simultaneously with their families, from disaster areas. Thank you for your willingness to act and for your compassion for animals! For more information on how you can help PETA help animals affected by disasters in Japan and elsewhere, please click here. Standing atop a pile of rubble, a small, scrappy white kitten lets loose a meow of protest. I almost decided against including this image, as I’ve yet to confirm its authenticity (i.e., whether it was actually taken in the aftermath of the earthquakes in Japan), but this stubborn kitten’s sweet, heart-wrenching tenacity won me over in the end. This post will be updated periodically, so please bookmark and revisit! This entry was posted on Thursday, March 17th, 2011 at 12:53 pm. You can follow any responses to this entry through the RSS 2.0 feed. You can leave a response, or trackback from your own site. I am an Executive Director of a Non-Profit Animal Rescue in Northern Ca, and along with everyone in the US our hearts go out to those in need in Japan after this devistating earthquake. Our heart though go out to the animals that are in need, the ones that are now abandoned and homeless and hungry. Our organization is working to raise money immediately to assist and help the needs of the animals in Japan but what we need is the who. What is the best organization to forward money to that will truly assist the animals in their care and welfare. Any help or suggestions would be greatly appreciated. Thanks you. In regards to animal rescue after a large-scale disaster, I personally prefer to support smaller, grassroots local groups over the large, international ones, since they’re already familiar with their communities and its needs and resources. Also, since they’re established in the area, they’re likely to stick around well beyond the immediate disaster relief efforts have ended. Alternately, donating to larger/non-local groups that are working in conjunction with existing local orgs is something else to consider. Of the groups listed above, I like Japan Earthquake Animal Rescue and Support, as well as World Vets, which is providing Japan Earthquake Animal Rescue and Support with veterinary supplies. If you’re on Facebook, I suggest following Japan Earthquake Animal Rescue and Support to get an idea of what they’re up to. Also check out some of the websites I linked to above; your priorities and preferences might differ from my own, so it’s best to look over the available options and reach your own conclusions. Thank you for sharing this great info! Didn’t realize the implications of donating to Red Cross. Doctors without Borders for now on. 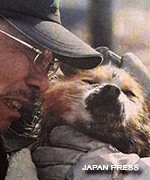 Also Japan Earthquake Animal Rescue and Support. It sounds like they do great work and run no-kill shelters. Apparently there are some harsh government policy regarding homeless animals over there. I hear they gas animals who are in shelters over 72 hours. Thanks so much for this, Kelly. In the same vein, Slate has a really informative article about the best ways to donate, and the problem with earmarking donations for certain projects or countries: http://www.slate.com/id/2288243/. I never thought that “too much aid” could be a possibility, but sometimes it really constrains the good an organization can do. I hear they gas animals who are in shelters over 72 hours. I saw JEARS mention that on its FB page :( Luckily, it looks like it’s only happening around Fukushima, due to the radiation. I’d be surprised if Japanese officials didn’t have more pressing matters to attend to than killing stray and homeless animals, at least in the short term. @ Shannon – That’s a good point re: earmarking. Something I tend to forget, probably due to my mistrust of the larger animal welfare groups.